Do you want to learn why the Blue Dancer is blue? Do want to learn something about the artist who made her? What do you notice first about this piece of sculpture? It is completely blue! Do you know why it is blue? I will give you a clue. It is made of bronze, a type of metal alloy made of copper and tin. What can happen to the surface of bronze over time when it is exposed to atmospheric elements? Bronze can tarnish. When the surface of a metal tarnishes, this means it has developed a patina. Specifically, a patina is a coating that forms on the surface of metals during exposure to atmospheric elements, including air, light, temperature, precipitation and pollution. This process is called weathering. You still don’t understand what a patina is? Do you have any change in your pocket or purse? Take out a penny and look at it carefully. A penny is copper-plated. If it is new, the penny will be a light copper color and will look shiny. But if it is old, the penny will look dark and dull. When the surface of a coin changes in color and texture overtime, we say it has developed a patina. While a patina can develop on metal naturally after exposure to atmospheric elements, an artist can choose to add a patina as a part of his or her original design. Different types of chemicals can be used to embellish the surface of a work with a wide variety of colors and textures. For those of you who love chemistry, cupric nitrate will change the surface of a copper-alloy like bronze to a blue-green. An artist can also speed up the process by applying chemicals with heat. Colors can range from whites to yellows, deep blues, greens, reds and blacks. Lastly, an artist can enhance the surface of his or her work further by waxing and oiling. A chemical substance was put over the entire surface of our work as a part of the original design. This chemical substance gave the surface of the bronze a beautiful blue patina. Our work is called Blue Dancer. Naturally! 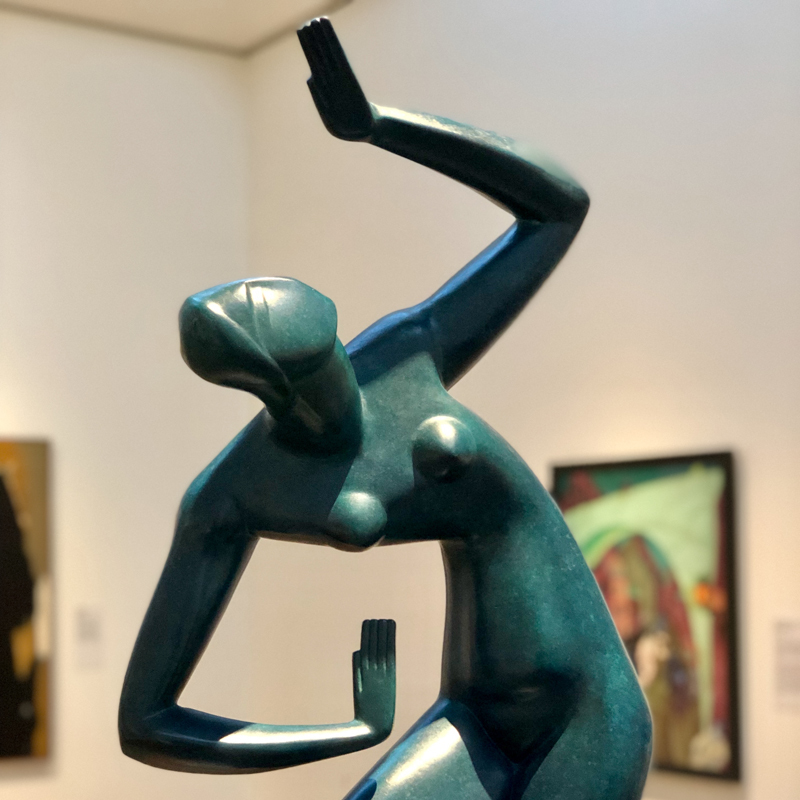 Blue Dancer was modeled by Alexander Archipenko about one hundred years ago but wasn’t cast in bronze until many years later. Archipenko was born in Ukraine (1887-1964). Do you know where Ukraine is? Ukraine is a country in Europe. Ukraine borders Belarus to the northwest, Poland, Slovakia and Hungary to the west, Romania and Moldova to the southwest, the Black Sea and Sea of Azov to the south and southeast, and the Russian Federation to the east and northeast. Early in his career when he modeled the Blue Dancer, Archipenko was thought to be one of the greatest living sculptors. When he was a child, he had an experience that one day would help him make a major contribution to art. He happened to look at two identical vases that were placed close together on a shelf and instantly he saw a third vase that was formed by the empty space in between the two vases. He would draw upon this experience and use a hole or other empty space as an important part of his design. We will soon see how this discovery would influence not only his own work but the work of other artists as well. Look closely. What is the Blue Dancer doing? She is dancing! When Archipenko was a young man, he spent time at the circus watching the performers, and he also watched dancers perform in the street. What do you think? Was Archipenko successful? Did he create a work of art about the human body in motion? How so? Draw an imaginary line down the center of the dancer’s body. Are both sides the same? If so, then she is symmetrical. If not, then she is asymmetrical. Since her arms and legs are posed differently, she is asymmetrical. What does this type of balance do to the work? Does the variety in her pose make her appear to move and sway before our eyes? Is there the sense of mass in motion? Or does she appear to remain stationary? Think about this for a moment. Archipenko didn’t like rough, detailed surfaces on sculpture. Instead, he liked sculpture with smooth surfaces, such as one finds in ancient Greek and Roman sculpture. Look carefully. The surface of the Blue Dancer is perfectly smooth. On the other hand, Archipenko didn’t like the true-to-life look of classical Greek and Roman sculpture. He preferred to strip away the details. Is Blue Dancer realistic? Does she have a lot of details? No, many of the details have been removed. What details did Archipenko leave out? Look at the dancer’s face. Does she have a nose? Does she have a mouth? What about her eyes? Are they implied by a simple outline? When an artist removes the details from a work of art, it is abstract. Since this work of art has few details, we can call it partially abstract. Blue Dancer is composed of simple geometric shapes. What shapes are there? Her breasts are shaped like cones. Her head is an oviform, which means it is shaped like an egg. Her elbows, knees and bent waist are shaped like triangles. Look at the empty spaces as well. Do you see a triangle between her legs? A trapezoid in the crook of her elbow? Empty spaces are an important element of design in Archipenko’s work. Other artists would be influenced by these empty spaces and would use them in their designs as well. The British artist Henry Spencer Moore said Archipenko’s sculpture influenced him to use empty spaces in his own works. 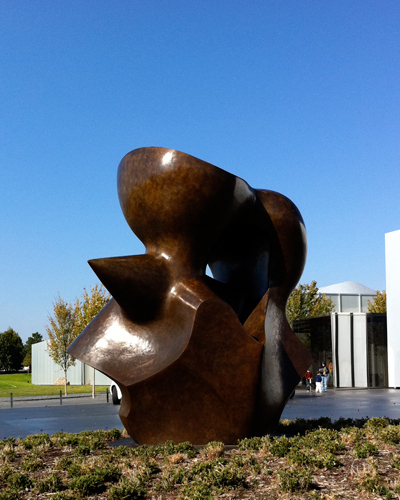 We can see empty spaces in Moore’s large bronze sculpture called Large Spindle Piece. Look carefully. What does this work look like to you? Some think it has soft curves like a cloud in the sky. Others think the sharp points that jut out from its curves make it look like some kind of mysterious machine. Still others think it looks like the figure of a woman. If you are lucky enough to see this work in person, perhaps you will see how the surface of the bronze reflects the sun and sky! Let’s compare these two works. There are differences between them. What differences are there? First, Large Spindle Piece is more abstract than Blue Dancer. We can tell that Blue Dancer is a figure of a woman. Whereas, it is not clear what Large Spindle Piece is. Second, Large Spindle Piece is made up of irregular, free-form shapes and geometric shapes, while Blue Dancer is mostly made up of geometric shapes. And of course, Blue Dancer has a beautiful blue patina over its surface. However, the two works do share things in common. Neither one copies nature but instead simplifies nature. It may just be me, but when I look at these works, I have the sense of mass in motion. Both Blue Dancer and Large Spindle Piece seem to defy gravity. They appear to rotate on an axis and occupy the space above and behind and around and through them. There seems to be tension and release in both works, which makes them full of energy and action. Would you like to see Blue Dancer and Large Spindle Piece in person? All you have to do is visit the North Carolina Museum of Art in Raleigh, North Carolina. Blue Dancer is in the Modern galleries at the museum. Large Spindle Piece is in the Museum Park. Or perhaps you would like a tour. Tours of the collection are given daily, except for Monday when the museum is closed to the public. If you prefer, you can contact the museum ahead of time and arrange for you and your friends to have a private tour. I’m sure a docent at the museum would be happy to show you and your friends Blue Dancer and Large Spindle Piece and many other works of art. Whether you visit the museum on your own or have a tour with a docent, it will be well worth your time!